What does a mindful approach to pregnancy look like and why is it important? Pregnancy is such a blessing, heralding new life and the miracle of creation. But it’s also a time of tremendous stress. That stress, if left unchecked, is potentially dangerous for both mum and baby. So how can you mitigate stress and cultivate a mindful mindset during pregnancy to keep calm and carry on. 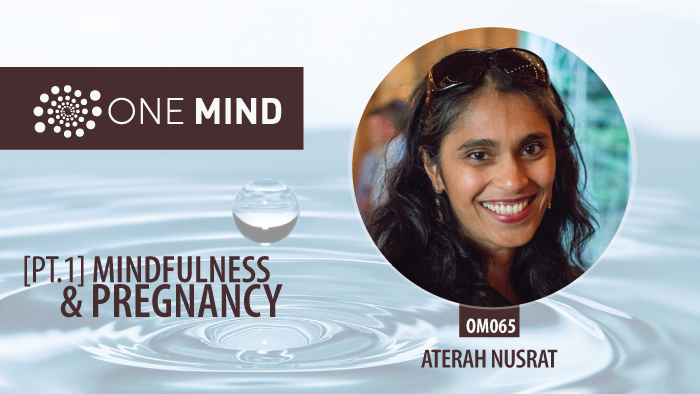 In this episode, we talk with long-time meditator and new mum, Aterah Nusrat about how to nurture a mindful approach to pregnancy. In part 1, we explore Aterah’s own spiritual journey, which started in a moderate Muslim household. Eventually, her spiritual interest led her to embrace and practice the perennial enlightenment teachings from the East. Over the last 23 years, Aterah has logged thousands of hours of meditation and several hundred thousand prostrations. All this has served to help her build a powerful mindfulness practice. In part 2, we explore in depth the relationship between mindfulness and pregnancy. As a brand new mother, Aterah has had ample time to reflect on the importance of bringing a mindful mindset to the ‘beautiful ordeal’ which is pregnancy, giving birth, and post partum. Medical professionals are clearer than ever about the deleterious effects of chronic stress. In general, stress-related illness is responsible for a huge portion of our medical costs. Our information saturated, do-everything now culture has everyone on edge. Relaxation is becoming a lost art! This is especially troublesome when you’re pregnant. You suddenly have a brand new array of concerns related to the health of the fetus in your belly. Will she make it to term? Are you eating all the right things? How are you going to manage work and time off? And how on earth are you going to deal with actually giving birth?? Some stress during pregnancy is normal, just as it is during other times of life. But if stress becomes constant, the effects on you and your baby could be lasting… ‘the kind of stress that’s really damaging is the kind that doesn’t let up,’ says Susan Andrews, PhD, a clinical neuropsychologist and author of the book Stress Solutions for Pregnant Moms: How Breaking Free From Stress Can Boost Your Baby’s Potential. In fact, constant stress could alter your body’s stress management system, causing it to overreact and trigger an inflammatory response. Chronic stress may also contribute to subtle differences in brain development that might lead to behavioral issues as the baby grows, she adds. 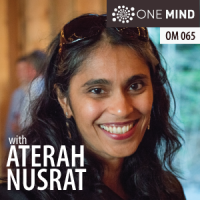 Aterah Nusrat is Program Manager at the Osher Center for Integrative Medicine based jointly at Harvard Medical School and Brigham & Women’s Hospital. She earned a Master’s degree in Environmental Technology from Imperial College in London and a BSc in Chemistry and Environmental Science from the University of Kent. Aterah has pursued meditation and mindfulness practices for over 20 years, nurturing her spiritual interests through Islam and eastern enlightenment teachings. In her spare time, when she isn’t climbing the steep learning curve of parenthood, she enjoys reading science fiction with her husband and cruising the green ways of her local neighborhood. I love the idea for this podcast topic, particularly as I am pregnant myself 🙂 But this episode didn’t get into the topic at all! Aterah has a very interesting story, and I would suggest renaming this episode to better reflect the content. “Mindfulness and Pregnancy — What You Need to Know” is not accurate, at least for part 1. Looking forward to the second part of the episode. Really good point! Yes, part 2 is all about the pregnancy and this part 1 was just a context setter. I like your suggestion a lot and will think of a more appropriate title. I think you’ll appreciate part 2 since it’s all about the nitty gritty of mindfulness and pregnancy. I’ll be curious to know what you think! You’re right! We’ll work on a new title, and define it as the precursor to the pregnancy content. And, congratulations!! Wishing you all the best for your journey to parenthood. I love hearing about how other people have been introduced to meditation, and how they have made it part of their life and routine (since that is where I have the most trouble). So all the background we got with this week’s episode was wonderful. Can’t wait to hear how your practice helped you through pregnancy and even how it is helping now, with a newborn — both of you. Congratulations to you, too! Thanks Vanessa! Looking forward to hearing what you think of part 2! All the best to you! Morgan, too much talking by you…2 intros, interruptions, waffle. Nice subject though. Hi Gordon, Your feedback about the 2 intros was helpful. Thanks for pointing that out. I edited it. I am very happy after read this article Congratulations!